The Lock ’n Load Tactical Series hits harsh and unforgiving desert terrain in Heroes of North Africa. As World War II unfolded, Mussolini and Italy’s colonial expansion in Libya and East Africa were at stake, as well as the Axis’s desire to control the Mediterranean Sea and the Suez Canal. In the beginning, only Britain and her Commonwealth Allies could stop them. From 1940 to 1943 a relentless, bloody push and pull of forces across the desert, from Egypt to Morocco, ensued. Play dynamic scenarios that feature everything that makes the award-winning Lock ’n Load Tactical Series stand out—fluid, impulse-based turns; squad-level and individual heroics—plus lots of armor and unique rules to bring desert combat to life. Italians, including paratroopers from the rugged Folgore Division, and Rommel’s vaunted Afrika Korps take on the resolute British Eighth Army. The Free French and Americans also get into the action. The battles start in 1940, with a few in East Africa, and Sidi Barrani, Egypt, and continue up to El Alamein and the Americans’ first taste of combat during Operation Torch, in November of 1942. 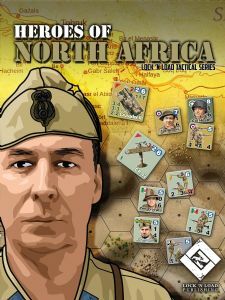 Heroes of North Africa has the most components of any game in the series to date, so find a pair of goggles; the dust and sand of the desert is going to fly!